Sophomore forward Neila Luma dribbles the ball during a game against Monmouth last month. When: Saturday, Jan. 5 at 11 a.m.
After securing a 51–38 victory against Memphis on New Year’s Day, women’s basketball (3–10) begins Atlantic 10 play by welcoming Fordham (9–5) to the Smith Center. The Rams seem to be hitting their stride, heading into the match riding a four-game win streak while the Colonials snapped a four-game losing streak with their most recent win. GW also kicked off its conference schedule against Fordham last season and dropped the match 61—50 in the teams’ only meeting of the year. Fordham and GW tied for third in the A-10 preseason poll this season. In last year’s A-10 opener against Fordham, senior guard Mei-Lyn Bautista and sophomore forward Chyna Latimer notched 12 and 14 points, respectively, in the loss. Head coach Jennifer Rizzotti will need well-balanced production from her offensive core to secure a win against the Rams this time around. The Rams’ roster houses two players in double-digit scoring, with the rest of the team putting up a comparable number of points to GW’s roster. Redshirt sophomore guard Bre Cavanaugh averages 18.5 points per game and senior forward Mary Goulding chips in 10.5 points per contest for the Rams. Bautista leads the Colonials with 10.2 points per game. If the Colonials can limit Cavanaugh and Goulding while picking up extra point production from the GW bench, the team might be able to rise above the Rams. The Colonials showcased a new-look starting lineup against Memphis that saw mainstays redshirt sophomore forward Sarah Overcash and sophomore forward Neila Luma come off the bench. Against Memphis, Luma contributed nine points and nine rebounds as a role player, while Overcash picked up five rebounds in the win. 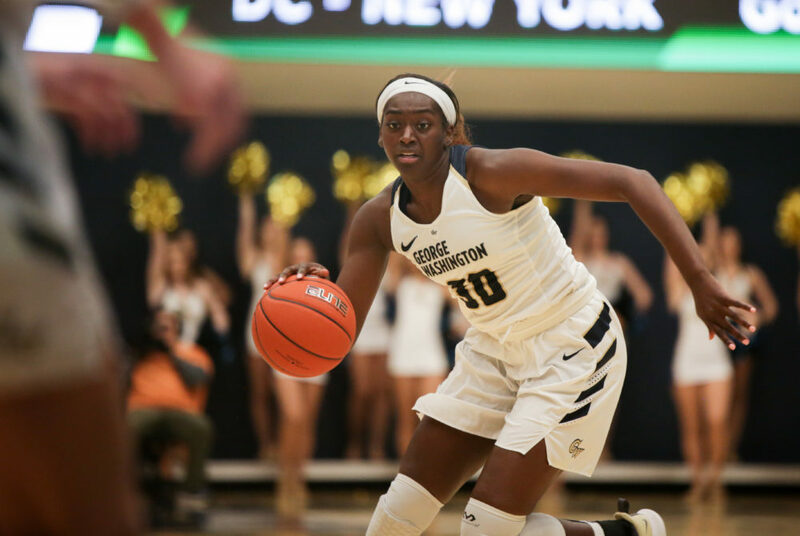 A total of 10 Colonials scored against the Tigers, and with more depth coming off the bench against Fordham, GW should be able to put up points efficiently against a Rams defense that allows opponents to shoot 43.1 percent from the field. Freshman guard Maddie Loder has seen a significant uptick in minutes lately and her presence should help to take attention away from Bautista, who is the only Colonial averaging double-digit points. Loder picked up seven points and five rebounds as a starter against Memphis. While GW has averaged just 50.4 points per game as a team, its defense has been elite at times. GW enters the contest coming off the team’s best defensive showing of the season and the Colonials’ perimeter defense has been a highlight all season. Opponents shoot a paltry 26.3 percent from beyond the arc against GW. With the Rams putting up numbers from distance well below their midrange totals, the Colonials should pack the paint and force Fordham to take the long shot. Cavanaugh has been transformative for Fordham since transferring from California following an injury-plagued freshman year. Averaging nearly 19 points per game, Cavanaugh outguns every Colonial on the court and helps contribute to the Rams’ 39.7 shooting percentage from the field. If she gets hot from the floor, it will be difficult for the Colonials to contain Fordham’s offense. The name of the game for Fordham will be a fast start. The Rams average more points in the first quarter than any other and have put up double-digit points in the opening frame in their last four games. Fordham managed to pick up 27 points in the game’s opening 10 minutes against Columbia, while the Colonials have been held to single-digit scoring across the last four contests, including their win over Memphis. Fordham will most likely be able to build a sizeable lead in the opening frame before the Colonials can heat up. Fordham has been excellent retaining the ball, committing just 10.2 turnovers per game while the Colonials cough up possession 15.1 times per match. The Rams should be able to enjoy extra offensive opportunities as a result, which could prove crucial to their chances Saturday. Although the Colonials will have home court advantage, they still face an uphill battle against Fordham. GW will need multiple players to reach double-digit scoring as well as find a way to limit Cavanaugh, who can single-handedly win the game for Fordham. The match will be a measuring stick for both teams in the A-10, but the Rams will likely walk away with a win to start their conference schedule.